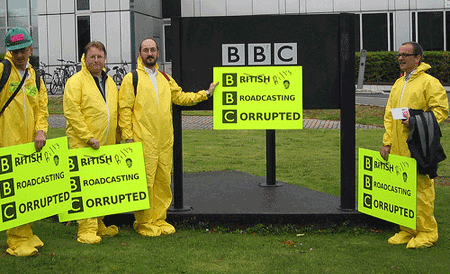 The planned protests against the BBC, which we reported on a few weeks back, took place today as supporters of the Free Software Foundation (FSC) — dressed in bright yellow Hazmat suits — gathered outside BBC Television Center in London and BBC headquarters in Manchester to demand that DRM be eliminated from the BBC’s iPlayer. The FSC is accusing the BBC of “corruption” because of the iPlayer’s reliance on Microsoft’s technology and the fact that, prior to joining the public service broadcaster, the controller of the BBC’s Future Media and Technology Group worked for Microsoft as director of its Windows Digital Media division. BBC values have been corrupted because BBC Executives are too closely associated with Microsoft. BBC values have been corrupted because the iPlayer uses proprietary software and standards made under an exclusive deal with Microsoft. BBC values have been corrupted because license fee payers must now own a Microsoft operating system to download BBC programming. BBC values have been corrupted because license fee payers must accept DRM technologies that spy and monitor on the digital files held on their computers. We are here today to help BBC Director General Mark Thompson, clean up this DRM mess, and to encourage the BBC Trust to reverse course and eliminate DRM from the BBC iPlayer. I agree….I’m not sure I’d call the BBC corrupt, but it does seem strange that the best they could do was a Windows-only platform in a web-based world.